It looks like one is a member of a rather exclusive circle when one reads books by British author Norman Lewis. On the Bibliophile network LibraryThing, which boasts 1.5 million members, only an average of 30 people, with some exceptions, have any of his works on their shelves. This is surprising, for Norman Lewis, who passed away a few years ago at the age of 95, was a very prolific writer and although he published his first book at the mature age of 41, he left us a legacy of 13 novels,15 works of non –fiction and many articles. According to Graham Greene, Norman Lewis was one of the best travel writers, not only of the post – war decade, but of all the decades of the last century. The Telegraph, in their 2003 Lewis obituary, added that not only was Lewis indeed the best, but also and certainly the most underrated English travel writer of the last hundred years. Not having read Norman Lewis is a pity, for he is an interesting and talented writer, but it is also a bit of a shame, for this sensitive and discreet gentleman, had some intelligent things to say about quite a few dreadful matters. It is he for instance who in February 1969, in his article “Genocide in Brazil”, published in the Sunday times, first alerted the world about the communities of Amazonian Indians, who were being exterminated in a genocide, orchestrated by the very organizations whose task it was to protect them. Lewis was fascinated by cultures untouched by our so-called civilization and disgusted by how the advancing Modern world, was pushing the tribal people into extinction. In “A voyage by Dhow”, which is a collection of stories, written between 1970 and 2001, several chapters describe such cases: The Uzbeks plainsmen who receive communist suits from the central Russian administration instead of the coloured textile they need to make their traditional dresses, the Mexican Huichol people cornered and endangered by organised mass tourism and worst of all, the activities of fundamentalist Protestant missionaries, who willingly and effectively destroy the last South American tribal societies, small communities on the brink of extinction, like the The Panare in Venezuela or the Guyaki in Paraguay. The general outcry that followed Lewis’ articles brought a few culprits to court and led to the creation of such organizations like Survival international, an organization dedicated to protect the last surviving “tribal people”. I ordered my first book by Lewis, “Naples ’44”, an account of his experiences during the Allied occupation, after reading Malaparte’s “The Skin”. Malaparte’s cimmerian description of the people of the liberated city of Naples is so shocking and grotesque, that I needed a less artistically manipulated version of the same period to confirm its factuality. Lewis’ book, too my despair, contained the same shocking and grotesque anecdotes as Malaparte’s book, albeit recounted in a different and more believable way. But Lewis, as a writer, caught my attention. His exact and concise prose peppered with irony and now and then an extremely funny anecdote, makes his book agreeable readings. Both truthful and entertaining without the cumbersome embellishments we come to associate with more famous travel-writers, they harbour in their core the spirit of a true reportage. He reminds me at times of Kapucinsky, and occasionally he catches the peculiar detail just like a Chatwin, like when for instance, he describes his visit to Tamerlane’s tomb and adds that he has to cover his mouth with his hand in order to keep silent and not disturb the death King, one can still hear whispering through the sarcophagi of Jade. Lewis physical appearance was innocent and inoffensive. With his toothbrush moustache, and retired schoolteacher looks, he could blend into any scenery without attracting attention. His biographer Julian Evans, called him the Semi-invisible Man. These features combined with his knack for foreign languages made him an ideal spy. And that he occasionally was. His colleague at the Sunday Times, Ian Fleming, sent him to Havana, to check out Castro’s intentions for a “coup d’état”. Lewis met Ed Scott, the “real” James Bond, in secret, in a lurid bar. Unbeknownst to both of them, Graham Greene was there too, who, witnessing the scene, immediately scribbled down some ideas for his “Man in Havana”. 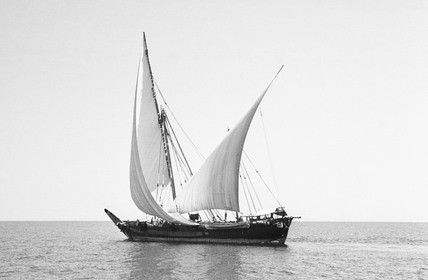 Lewis is on a secret mission too in the title story “A Voyage by Dhow”. Together with two other men, a senior from the Foreign Office and Ladislas Farago, a notorious Hungarian double-agent, he tries, in the spring of 1937, to enter Yemen, a country completely closed to foreigners by their suspicious and xenophobic rulers. Entering the desert country by road or by air is completely impossible so they decide to travel by Dhow from Aden - city, then a British protectorate, to Hodeidah, Yemens only port. They can join with a number of Arab pilgrims, who are returning home by sailing up the Red sea coast. Delays in departure, problems caused by off-season sailing and the hostility of the Yemenites all contribute to sabotage the attempts to safely disembark in Hodeidah. In fact Lewis and his companions will completely fail in their enterprise. While the progression of the three men towards Hodeidah slows down to a standstill under a fierce light and a blazing heat of the wind still days, it is Lewis’ descriptions, of the many details of life on board which makes for compelling reading. Images out of the 1001 nights came to my mind. This is how we imagine scenes of the real Simbad the Sailor. Men and women with their children, animals and belongings sleep on deck. Invariably at night someone is humming an old song or playing an instrument to ward of homesickness. On departure, the pilgrims braving the sea for the first time, wrap cloth over their mouth, to avoid that their scared spirit leaves their body. People also cover their faces with blankets at night so as not to be touched by “moonlight”. The days are scheduled with prayers and orchestrated by the Nakhoda – the captain. Lewis fellow passengers are a colourful bunch: a restaurant owner, a magician, a pearl merchant, a tribesman on his way to fight for free Abyssinia and a circus performer riding his unicycle over deck. There is also, and surprisingly, a prostitute on board, a young girl who attends to the sailors from time to time. While Allah and superstition seem to tolerate such practices, the women on board do not, and one night, they attack the girl by dousing her with a bucket full of piss. The passengers will endure long days of heat, restricted rations of water and boredom until finally when they reach Hodeidah, their destination. As negotiations between the captain and the city-officials, about the three foreigners on board turn sour, unexpectedly a shocking message is played out on the shore: A mob drags a crying man onto the beach, to a spot just in front of where the dhow is anchored. While Lewis and his fellow passengers look on, under shouted approval of the crowd, the poor fellow's head is chopped off by a dancing executioner. On board, everyone is struck by the ghastly scene and a silence creeps over the ship. And so does Lewis’ story acquire the power of a parable. A parable of forbidding shores, hostile strangers and monotheistic Gods, who are invented by the wicked, to amplify and manipulate in an evil way the few unimportant differences that separate us from our fellow men.